… the population of [Carpathian-Ukraine] only amounts to about half a million people. The evidence of the eye would suggest that about half of these are Jews; actually a sixth is probably nearer the truth. The remainder comprise some of the most miserably poor and racially mixed people in Europe; most of them do not themselves know what they are, but they do know that they have nothing to eat. Many of them speak two, three, four or five languages or dialects, and have been successively told in the last twenty-five years that they are Hungarians, Ruthenians, and, now, Ukrainians. The proportion of them who have any knowledge of what a Ukrainian is is very small. This is not very important; the only thing that is important for these people is that they should be lifted out of the misery in which they live, and if anything happens to achieve that, whether it be called the Great Ukraine or what not, it will be welcome. Never have I seen such poverty as reigns in Carpathian-Ukraine, although I believe rather similar conditions existed in Ireland, before the war, before the Irish took their affairs into their own hands, in the days when the land was at the mercy of the absentee landlord. Here, in these remote Carpathian hills and valleys, the peasant has a house without a chimney, without flooring. He builds his fire on the stamped-earth floor and the smoke just rises and filters through the roof. Geese, pigs and goats, if he is lucky enough to have any, share the one room with him and his family. For food, he has insufficient quantities of maize bread, which is only just edible. If he has half an acre of land he may pull a rudely-fashioned plough across it himself, or turn it over with a spade. Money he never sees. He thinks with regret of the great days when he could at harvest time at least go down into Hungary and work on the big estates and bring back, as his wage, a side of bacon for the winter. That was wealth, to him. These peasants, their wives and children, live like animals. Even that is an under-statement. In many districts they are animals. I can see hardly any difference between their life and that of an animal. In one district, round the villages of Svalava and Verezky, where there are a few small factories, inter-marriage and the drinking of methylated spirits has produced a stunted race of deformed and mentally inferior people. Their life is so hard and their wages so small that their only solace is drinking spirits, and as they cannot afford pure Schnapps, at 36 kronen a litre, they buy methylated spirits from unscrupulous dealers at 5 kronen a litre. It brings intoxication and forgetfulness of hunger in half an hour. Carpathian-Ukraine is a good place to study the persecution of a non-Jewish community by the Jewish one. Here, for the first time, I saw the Eastern Jews in their native habitat. By the time they reach Budapest, Vienna, Berlin or Prague they are already Westernized. Here, as in Poland, you have the raw material of your Hollywood film producers and screen stars, your international bankers, your slick Jewish journalists - for here, in Carpathian-Ukraine, they are learning English, too. Here you have a peasant population that has been plundered and bled white in centuries of exploitation, that has passed from one tyranny to another, Czars, kings, nobles, the Church, Russia, Poland, Hungary, and is now completely in the thrall of the Jewish community, which according to statistics only comprises about 15 per cent of the whole, but which controls all the money-power, the trade, commerce and banking. It is a grip far more subtle but as vice-like as that of any dictators. There is no escape for the peasant. In Carpathian-Ukraine you are far more acutely aware of the Jews than in other countries, because they wear the uniform of black hat, caftan, ringlets and beard. In every town and village you enter they thus thrust themselves on your gaze, and your first impression is that they must be numerically predominant, that there must be more Jews than non-Jews in the place. This is not the fact. The reason is that they own all the shops and house-property in the main square and in the centre of the town generally. The non-Jews live in the meaner streets and remoter quarters. The way to test this is to go through one of these towns on Friday evening, when the Jewish Sabbath begins. Nearly all the shops in the place are closed; it is difficult for the non-Jewish population to buy anything on Friday evening or Saturday morning. The squeeze-out of the non- Jews is complete. Only large and financially powerful concerns, like Bata, can hope to compete with the Jewish traders, and perhaps a non-Jewish shopkeeper here and there who keeps going chiefly on what he earns on Friday evening and Saturday morning. The non-Jewish small trader, with little capital, almost invariably goes bankrupt before very long. The Jews quarrel a good deal, and violently, among themselves, but at the approach of a non-Jew they close their ranks with a solidarity impossible to find among any other people in the world, unless it be some remote race in Tibet. The wholesale trade is almost exclusively in the hands of the Jews, and the downfall of the non- Jewish interloper is achieved by supplying his Jewish competitors with goods at prices which enable them to undersell him. 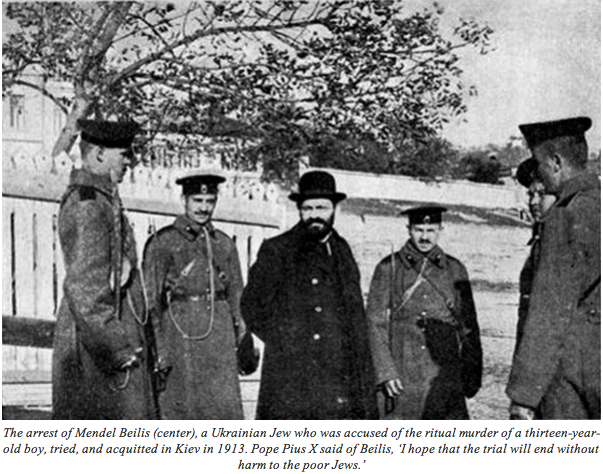 If any Jew fails to fall into line the services of the rabbi are enlisted and heavy punishments may be enforced against him; he may be refused access to the ritual bath, or the Jewish slaughterer may be ordered not to kill his chickens for him. The peasant is entirely in the hands of the Jews. If he has any money and wishes to buy anything, he must buy it from a Jew. If he has no money, and needs to borrow some for his taxes or his mortgage, he must borrow it from a Jew. If he has something to sell, he can only sell it to the Jewish dealers. If he wishes to hire a plough, he must hire it, at a high rate, from a Jew. Most sinister of all, if he wants a drink - and spirits form his only solace - he must go to a Jew for it, for the great majority of the alchohol licences are in the hands of Jews. If he goes to law, he puts money into the pocket of the Jewish lawyer - for in Carpathian-Ukraine only 19 of the 160 lawyers are non-Jews. To litigate against a Jew, in these conditions, is for him an almost hopeless proceeding. how could Pius X have been so deceived? From what I saw that guy was guilty in that ritual murder case. This sort of thing has become more common. Even one gal whose family practiced this kind of thing was on Oprah in the 1980s. It's not surprising that St. Pius X was ill informed of events in the Ukraine. Even during his time the Vatican was already in the throes of infiltrators. If we remember, it was the Mexican Bishops and Pope Benedict XV who betrayed the "Cristero's" in Mexico. The Pope and Bishops were told that the Cristero's were on the verge of losing the revolution, when on the contrary, they were on the verge of winning completely. The Mexican authorities and the American Masonic President, who interceded for the Masonic Government of Mexico, gave their assurances the Cristero's would be pardoned. The pardon was that over 30,000 Cristeros were hung from telephone polls or shot by firing squad. Isabella of Spain, was told by the Pope to adjust her war against the Turks and Muslims. She told the pope that he did not know what he was talking about and was ignorant of his own danger. Isabella even sent a war fleet to fight to protect Rome from the Turks, against the Popes recommendation. The Church's mission is to save souls and to advise men on the moral teachings of God. It is up to men to apply those teachings according to right stewardship and understanding. Many times the Church does not know or understand the civil dangers inherent in the world or what is actually happening.